If you need to work, online master’s degree programs allow you to keep your job and take classes around your work schedule. Even better, going online lets you earn your degree from a university that is more prestigious or has exactly the faculty, accreditation, courses, concentrations, or cost you want –but can’t get — locally. If you are searching for all the right online master’s degree programs, you face a huge challenge. 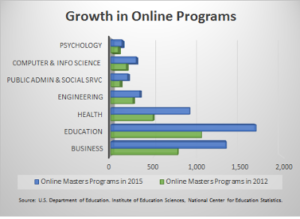 According to the U.S. Department of Education, the number of online master’s programs grew by 68% in the last four years, from 3,826 programs in 2012 to 6,414 programs in 2015. In the Business category alone, the number of online master’s programs grew from 782 in 2012 to 1,347 in 2015. There are only eight Master of Economics programs online today. Searching for these programs and reviewing the program details would take only a few hours of your time. But, there are 440 online Master of Business Administration programs, 83 online Master of Accounting programs, 108 online Master of Criminal Justice programs, 88 online Master of Public Administration programs, and 109 online Master of Social Work programs today. Searching every available online program to find the right one for you is just not practical or even possible for most people. The Online Degree Database is a complete source of information that helps you with the due diligence shopping that this investment of time and money is worth. You can find out exactly how many online master’s degrees are available in the market today using the Interactive Tool, especially among those degrees (MBA, MPA, MSW, and more) that are most popular.